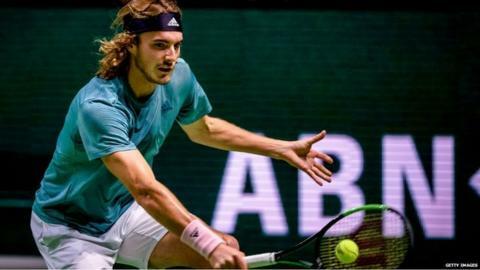 Stefanos Tsitsipas will make his debut at Queen's Club this summer as part of his Wimbledon preparations. The 20-year-old Greek, who knocked Roger Federer out of the Australian Open last month, will be joined by defending champion Marin Cilic. The Fever-Tree Championships take place between 17-23 June. "Stefanos was at the top of our list when it came to adding new names to the line-up in 2019," tournament director Stephen Farrow said. "Every year we try to put together a mix of established champions and rising young stars. "He connects with fans wherever he goes and we can't wait to see him on grass at The Queen's Club." BBC Sport will have live coverage from the west London club across television, radio and online. British number one Kyle Edmund is also set to play, while the future of Andy Murray - who has a career-long commitment to the ATP 500 event - is in doubt after he had surgery on his hip last month. "So many great champions have lifted the trophy over more than a hundred years," world number 11 Tsitsipas, who won his first ATP title of the year in Marseille last week, said. "I am looking forward to having my own chance to compete on grass for the title in June."